The Mayor�s Holiday Celebration complete with holiday entertainment, the lighting of the official holiday tree and fireworks will take place on Friday, December 3, 2010, 6 p.m. at City Hall, 901 Bagby, 77002. The featured entertainer will be Grammy Award winner Eddie Levert of The O�Jays. The O�Jays have celebrated R&B success with six top ten singles and a multitude of enduring and soulful gems, including the hit song Love Train. Please bring your entire family as well as a new unwrapped toy to the Reliant Energy Booth to make the holiday brighter for a child this season! Also, have your photo taken with Santa or one of the many Houston Ballet characters from The Nutcracker. 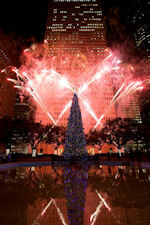 Reliant Energy is returning as the official tree sponsor and is supplying an energy-efficient tree that uses LED lights. New partners for this year include Southwest Airlines as presenting fireworks sponsor and vitaminwater as sponsor of the �Holiday Greetings for the Troops� area. We enjoy the continued support from the Houston Downtown District, Houston Public Library Foundation and the Houston Parks and Recreation Department. The event is free and open to the public. For more information see www.houstonspecialevents.org. As the holiday season approaches, the City Hall Farmers Market is a great place to choose holiday ingredients. You can shop at the market or e-mail the vendor ahead of time to secure your products. The market is open every Wednesday from 10 a.m. � 2 p.m. and is located around the Reflection Pond on Smith, between Walker and McKinney. Every week there are over 40 vendors selling fresh fruit, vegetables and prepared items. Each vendor is committed to sustainability as well as local and fresh food. For vendor information contact Urban Harvest at https://www.urbanharvest.org. Please help the Houston Fire Department (HFD) provide holiday joy this year to hundreds of children by donating a new or gently used toy to the annual Operation Outreach Stocking Stuffer Toy Drive. HFD will collect toys December 2 - December 16, 2010. HFD and KPRC Local 2 will kick off the 2010 Toy Drive on December 2 at the Channel 2 studios located at 8181 Southwest Freeway at Beechnut, 77074. Toy donations will be accepted any time between 6 a.m. and 6 p.m. on the kick-off day. December 2 � December 16, you can bring toy donations to any HFD fire station. A complete list of stations and maps to their locations are available at https://www.houstontx.gov/fire/firestations/index.html. For information on the 2010 Toy Drive, visit www.houstontx.gov/fire, www.click2houston.com or contact the HFD Public Affairs Office at 713.495.7900. Clothing donations will not be accepted. The toys collected by HFD will be distributed at the Annual Community Outreach Inc. Great Toy Giveaway on December 23, 2010. The Great Toy Giveaway will be held this year at New Light Christian Church located at 7317 E. Houston Road, 77028, from 8:30 a.m. to 4:30 p.m. or while supplies last. Toys will be distributed on a first-come/first-served basis. You must bring a valid State of Texas I.D. card and your children�s Social Security cards or birth certificates. For more information on the Great Toy Giveaway, call 281.454.4840. The toys will be distributed based on a limit of 5 children per family. Please no early birds or overnight campers. As the holidays approach, the Houston Fire Department would like to remind you of the steps you can take to make the season safe and joyous for your family and friends. Visit www.houstontx.gov/fire for the latest in fire safety information on everything from cooking to heating and decorating your home. REMEMBER: Working smoke detectors save lives! Have you tested yours lately? Test them today! The Houston Police Department�s (HPD) annual La Comida Food Drive is entering its 25th year of serving our communities. Now, more than ever, your help is needed to reach out and help our less fortunate neighbors enjoy a family meal this holiday season. HPD partners with Fiesta Mart, Inc. and The Pepsi Bottling Group to collect, package and distribute boxes of food to Houston�s underprivileged families. Last year, HPD was able to distribute 3,500 boxes of food. Donations of non-perishable food items and cash will be accepted from noon to 8 p.m. on Thursday, December 2, and Friday, December 3, and from 9 a.m. to 5 p.m. on Saturday, December 4, and Sunday, December 5. Please visit one of the 14 participating Fiesta Marts below to contribute to this important Houston community need. 8 a.m. and 4 p.m. The City of Houston (COH) Solid Waste Management Department will embark on its 20th year of Christmas tree recycling after the holiday by providing recycling drop-off sites throughout Houston. All drop-off sites will be closed on New Year's Day. Trees with artificial snow (flocked) will not be accepted for recycling; they will be picked up on the neighborhood's scheduled "Junk Waste" day in February. Commercial vendor trees will not be accepted. Living Earth Technology, a leading composting company in Houston, has partnered with the COH to make this a very cost-effective program for the city. Living Earth Technology composts all the Christmas trees at no cost to the COH. Homes with COH automated garbage collection service may place their trees at the curb on their "Tree Waste" day in January or bring them to one of the Christmas tree recycling locations. For more information visit www.houstonsolidwaste.org or call 3-1-1. The City of Houston Solid Waste Management Department has several locations for you to drop off your holiday recycling. Christmas trees, burned out compact fluorescent (CFL) light bulbs, holiday wrappings and appliances may all be recycled. Please commit to having a greener holiday season. See www.houstonsolidwaste.org for more details. North 9003 North Main, 77022 � NEW! Southwest 10785 Southwest Freeway, 77074 � NEW! Westpark Consumer Recycling Center, 5900 Westpark, 77057 (also includes tires, batteries, used motor oil, latex paint and antifreeze, and scrap electronics recycling) Open Mondays through Saturdays 8 a.m. - 5 p.m.
Environmental Service Center (ESC) - South, 11500 South Post Oak, 77035 (For household hazardous waste and scrap electronics recycling only) Open Tuesdays and Wednesdays 9 a.m. � 3 p.m. and the 2nd Saturday 9 a.m. � 1 p.m.
Environmental Service Center (ESC) - North, 5614 Neches, Building C, 77026; Open 2nd Thursday of the month 9 a.m. - 3 p.m.
Management Department facilities, see www.houstonsolidwaste.org. A simple act in your kitchen could save you from costly repairs and reduce the possibility of having a sink, toilet or drain back up during the holidays. Do you remember when your grandmother would save cooking grease in a jar on the stove and use it later? This small practice could help save millions of tax dollars in repair and maintenance cost to the city sanitary sewer lines that run from your home to main sewer lines that run underground. Pouring fats, cooking grease and oils down the drain is a common mistake lots of cooks make. Animal fats, greases and vegetable oils poured into drains solidify and clog pipes. Cooking grease can get as hard as concrete, causing sewage to back-up and overflow into streets, yards, and storm ditches. The most practical way to reduce grease from kitchens is to follow some easy steps. Unclogging sewer lines is costly to repair and maintain. 1. Take a minute to properly dispose of grease, and other items that can clog your plumbing. 2. Remember, garbage disposals are not effective for disposing fats, oils and greases. 3. Consider using coffee cans, pet food cans, and food jars, etc., that you already have in your home. Instead of throwing them away empty, use them to collect your cooking oil or grease. 4. Use oven roasting bags (sold in grocery stores) or foil lined bags to dispose of grease. Remember to dispose the containers in the trash. Homeowners have the ultimate responsibility to maintain the sanitary sewer lines that run from their homes to where it connects to the city line. If a blockage is causing problems in a home and it is discovered to be in a city line, a crew will come out and clear the line. For more information on how you can reduce sewer line blockages, visit the �Corral the Grease� website at https://www.publicworks.houstontx.gov/utilities/corral_grease.html.